E*Kits Debridement Trays: Instead Of Creating Storage Space For Numerous Items Which Are Pulled Again And Again For Similar Procedures, A Convenient Sterile E*Kit From Medline Is A Single Item Pulled From A Single Location. Components Are Packaged In Sequence Of Use, Allowing The Clinician To Progress Efficiently Through Procedures. Sterile E*Kits Can Be A Valuable Tool In Standardizing Protocols For Quality Patient Care; When The Items Necessary For A Procedure Are Supplied In A Single Tray, Facility Protocols And Continuum Of Care Are Easier To Be Established And Maintained. Cost-Effective. Since All Components Necessary To Perform The Procedure Are Prepared In A Single Sterile Disposable Tray, Less Time Needs To Be Spent Ordering Supplies And Preparing For The Procedure, Saving Your Facility Both Time And Money. 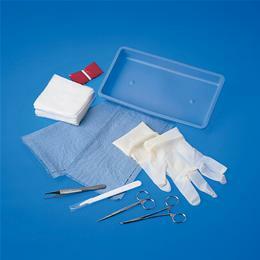 Sterile E*Kits From Medline Include Standard Components. You Can Also Design Your Own Custom Sterile E*Kit To Meet The Specific Needs Of Your Facility. Contains: Iris Scissors, Adson Forceps (1X2 Teeth), Scalpel (No. 10), 2 Gauze (3"X3"), Cotton-Tipped Applicator, Alcohol Prep Pad .